A large bell buoy is approximately ¼ mile due east of the inlet. 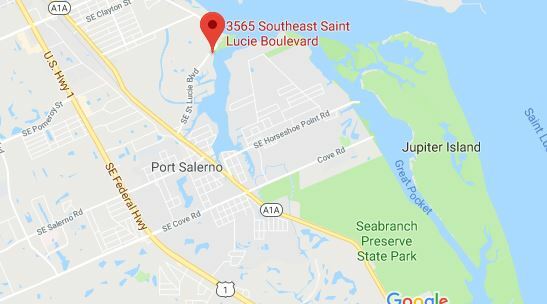 After navigating through the inlet, head WESTWARD for approximately 1mile to the intersection of the Intracoastal Waterway, RED marker 240, and continue west for approximately ½ mile. To your port side, pick up markers 1 GREEN and 2 RED entering the Manatee Pocket. We are the 1st marina on the WEST SIDE. 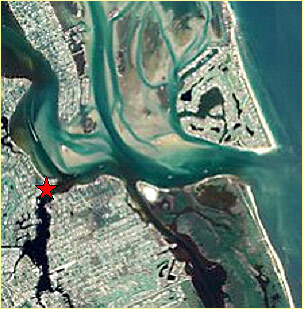 Turn west at RED marker #240 at “crossroads” (where the ICW and St. Lucie Inlet channel cross). To your port side, pick up markers 1 GREEN and 2 RED entering the Manatee Pocket. We are the first marina on the West side of the Pocket. After GREEN marker #9, to your starboard side pick up markers 1 GREEN and 2 RED entering the Manatee Pocket. We are the 1st marina on the WEST side of the Pocket. Turn WEST at “crossroads” (where the ICW and St. Lucie Inlet channel cross) at GREEN buoy #3 (port side). To your port side, pick up markers 1 GREEN and 2 RED for the Manatee Pocket. We are the first marina on the WEST side of the Pocket.